November 11,1918, marked the cessation of fighting, or armistice, in Europe ending World War I. In 1938, the U.S. government declared November 11th Armistice Day, a national public holiday. After World War II and the Korean War, Congress replaced the word “Armistice” with the word “Veterans,” according to the U.S. Department of Veterans Affairs. To this day, Americans thank those who fight or fought for their country on November 11th each year. Veterans Day is not typically known for its outlandish decorations, as some holidays are, but many people choose to decorate to show their support and patriotism. People decorate with wreaths for practically every U.S. holiday, and Veterans Day is no exception. Wreaths in red, white and blue hung on front doors show patriotism. Some people choose to make their own wreaths by gluing red, white and blue stars to a wire circle. Others choose to make-over a plain wreath with red, white and blue ribbons and American flags. Veterans Day wreaths are reusable for other patriotic holidays such as Independence Day and Memorial Day. You may use other colors if you wish, though red, white and blue are most often used on patriotic holidays. People in the Western world traditionally wear poppies as buttonholes on Memorial Day in May, but they hold the same meaning for people on Veteran’s Day in November. Alternative options include poppy wreaths, fabric poppy arrangements and poppy paintings. The significance of the poppy in remembering fallen soldiers comes from the poem “In Flanders Fields” by Canadian Colonel John McCrae, according to the U.S. Department of Veterans Affairs. The first lines of the poem say, “In Flanders fields the poppies blow, between the crosses, row on row...” The poem is about McCrae’s grief at seeing rows of graves of soldiers who died on the battlefields of Flanders during World War I. 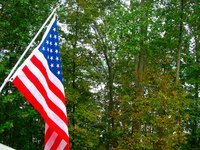 Decorating with American flags can be as simple or as complex as you choose. Many people choose to hang a single flag in front of their house year-round. According to Cornell University Law School, the U.S. Code states that citizens displaying the flag horizontally or vertically against a wall should ensure that the blue field is to the observer's left. Those displaying the flag on a staff in front of a building must place the blue union portion at the peak of the staff when the flag is at full mast. If you hang more than one flag, the U.S. flag must be higher than the other flags. The flag must also never touch the ground. For Veterans Day, U.S. flag banners make a different display. You can also purchase U.S. flags that attach to car windows.